If your concrete is sinking, there is a very good possibility that the concrete slab was installed on poorly compacted fill dirt. Sub-surface erosion and shrinking soils are also possibilities. 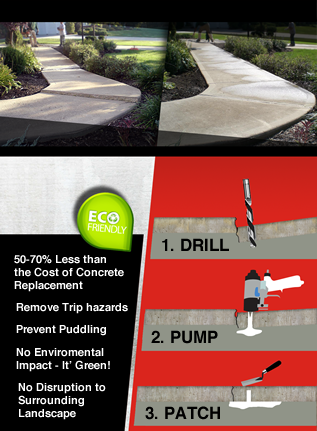 Rest assured that you may not have to replace the concrete. R.F. Woehrmyer Concrete Construction, Inc. can raise and level a concrete slab back to its original position by injecting a polyurethane foam into a series of small holes beneath your slab to achieve the desired result. This process is known as slabjacking. We simply drill strategically placed holes into the slab. Then, using a portable pump and flexible hoses, our expert technicians fill these holes with the special mixture to float the slab back to its original position. Lifting a slab using this method can often be accomplished in a few hours. Often times the cost to perform this service is less than half that of replacing a new slab. It can be done in virtually any weather. The material injected beneath the slab provides a strong base. There is little or no disruption to landscaping. Nothing needs to be moved off the slab, as the pump can lift the weight of the slab and anything you have placed on it. The newly raised and leveled concrete (driveways, sidewalk, patios etc..) can be driven and walked on in as little as 1/2 hour after the work is completed. We partner with customers, designers, subcontractors and suppliers on hundreds of projects each year.